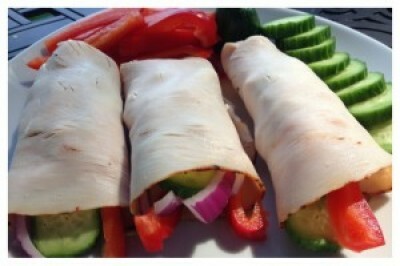 My Veggie filled turkey roll-up are a perfect snack on the go and for the kids! These roll ups are easy to make, delicious, and anyone will enjoy them. Use your favorite vegetables to create the perfect snack or lunch! In a small bowl mix together honey, thyme, lemon juice and Dijon mustard for your dressing. Lay a slice of turkey on a clean work surface. Add a small handful of lettuce, then a couple of sticks of cucumber, red pepper, red onion then a slice of avocado. Top with a basil leaf and roll it all up in the turkey slice.